blue felt glued to a big poster board-size piece of foam core. I just drew with permanent markers (Sharpies) on stiff felt from the craft store. Then, I carefully cut them out and handed them to "C"
and requested a rocket ship, some stars, and her own pink planet. "E" asked for an alien, a UFO, and her own blue and purple planet. 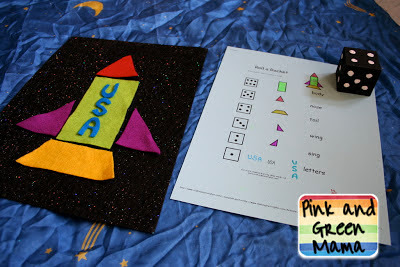 I also put together this little game for "C"s preschool at home centers. that I found through the Counting Coconuts blog. so I went ahead and made ours as a mini felt board. (Remember this one?) I made for the girls at Halloween in 2010. (stiff) felt that I had in my craft supply stash. The space ship parts are made out of scraps of felt. The dice is a wooden block we painted black and added our own white painted dots. there is a piece of the rocket ship that corresponds to the numbers on the dice. so she'd have an easier time working independently. 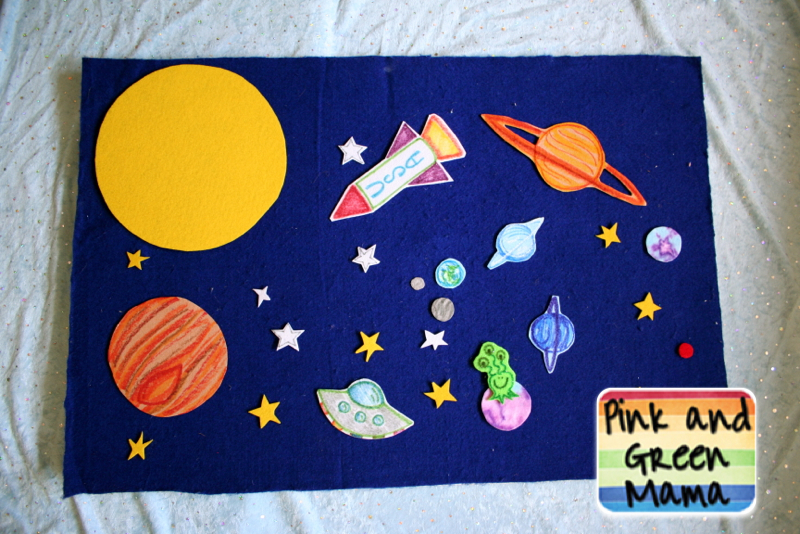 Bonus - she can play with the rocket ship on her big felt board too! I'll be sharing more of our Outer Space fun all week. biggest Smart Summer Challenge giveaway of the summer!